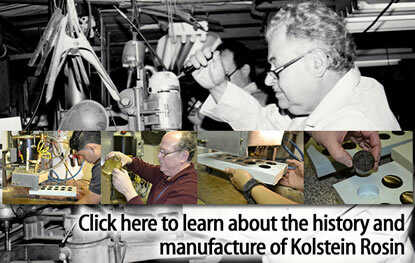 Welcome to the home of Kolstein Rosin. research and development for the professional player’s needs. Prior to the development of Kolstein’s Formulation Supreme Rosin, rosin was generically made for all instruments with players being forced to use rosins which were not formulated with the individual instrument’s requirements. For that matter, the violin, viola, and cello players were using identical kegs of rosin. Kolstein’s Formulation Supreme Rosin has corrected this problem so that each string player has the option of having not only their own specifically formulated rosin, but in the case of the cellist, both a normal and slightly tackier medium grade. For the bassist, there is an option of Hard, All-Weather or Soft Grade to accommodate personal preferences. Through much tedious research and experimentation, as a result Kolstein Music has produced the Kolstein Rosins specifically formulated for each instrument and each individual player’s needs. 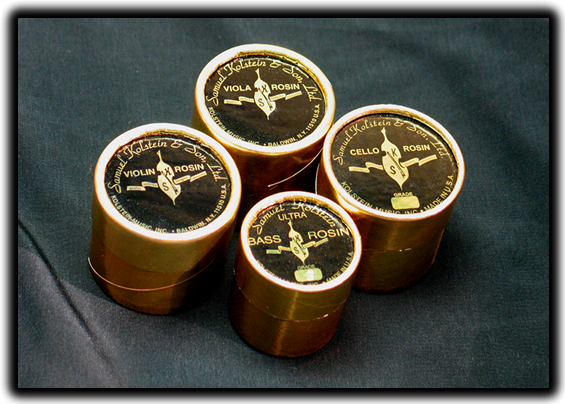 Whether you need Violin rosin, Viola rosin, Cello rosin or Bass rosin, Kolstein’s has a rosin developed specifically for your needs.